What to Do When You Can’t Uninstall iTunes Windows 10? Some of the recent problems iOS users are facing nowadays is that they are unable to uninstall iTunes, particularly on Windows 10. You may need to uninstall iTunes for many reasons, including troubleshooting, manual updating, or something else. 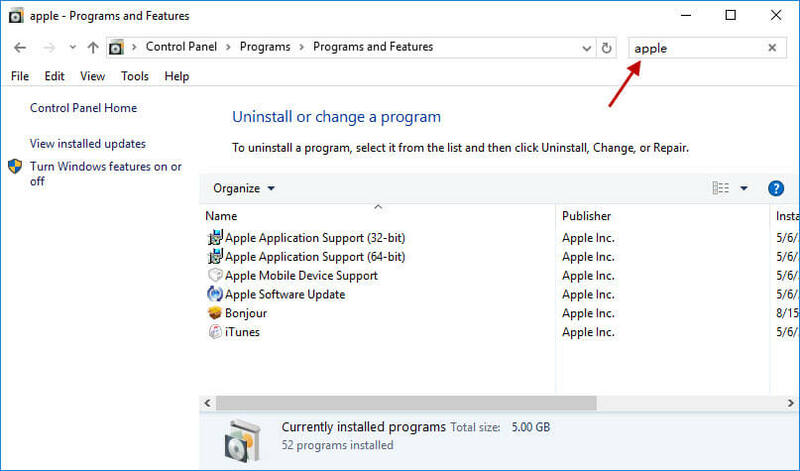 But if you can’t uninstall iTunes windows 10 the usual way, then you will need to find other ways to do this. There could be a number of reasons behind this problem. The possible main cause may be incomplete iTunes installation or corrupt download of the iTunes installer. 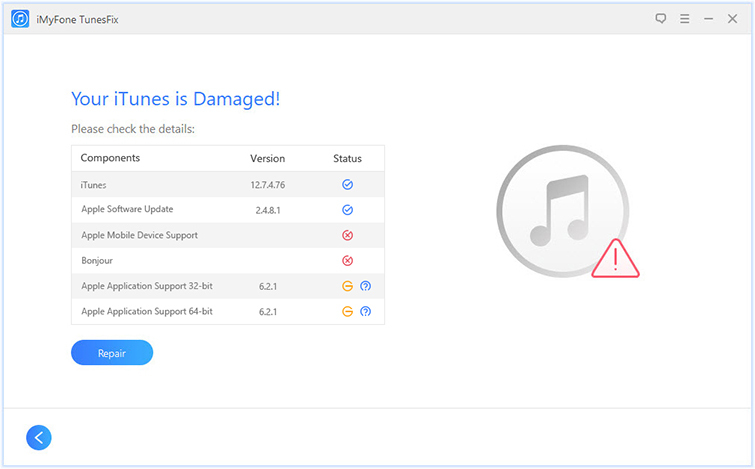 However, there may be other causes including iTunes-related program files corruption, corruption in Windows registry due to a change in iTunes-related component, or another program conflicting with iTunes or it might have deleted iTunes-related files. Using a professional tool to uninstall iTunes completely is the most convenient way to solve your iTunes uninstallation problem. iMyFone TunesFix is a professional iTunes repairing tool that can fix 100+ iTunes issues as well as uninstall iTunes completely with a single click. If you are looking for an automatic way to fix the uninstallation problem, then TunesFix is a recommended option. TunesFix will uninstall iTunes as well as all its related components within a couple of minutes, allowing you to install the new version with ease. Completely uninstall iTunes as well as all its related components with one click. Fix more than 100 iTunes issues in the most efficient and the quickest way possible. Clean junk/temporary files of iTunes to boost its performance. Variety of manual repair modes that allow you to repair specific iTunes issues quickly. Your data in your iTunes library is not lost when repairing iTunes via TunesFix. Step 1: Launch iMyFone TunesFix on your PC. Step 2: Upon launch, the software will automatically look for potential iTunes issues. If an issue is detected, then you will need to use the Repair button to fix it. If no iTunes issue is detected, then the home interface of TunesFix will open. Step 3: From the home interface of the software, click on the Full Uninstall mode. Step 4: On the next screen, click the Uninstall button to proceed. If you also want to delete user data along with uninstallation, then tick the option shown below the Uninstall button. TunesFix will start the uninstallation process after the configuration. If you don’t want to use software to automatically fix the problem, then there is manual fix as well that you can try. The process is a bit lengthy and complicated as compared to the automatic fix. Step 1: Open Registry Editor on your Windows PC. 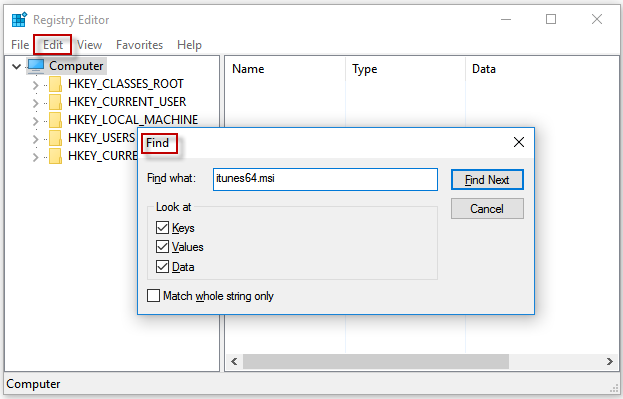 Step 2: Once it is open, select Edit > Find, and then type itunes64.msi in the textbox. Also change the Look at boxes and make sure that Data option is ticked. Click Next after configuration. Step 4: Now select the immediate parent key that contains a long string, right click on it and then choose Export. Save it to the location of your choice. Rename the file as iTunes.reg. Step 5: Click the same string again and Delete it using the context menu. 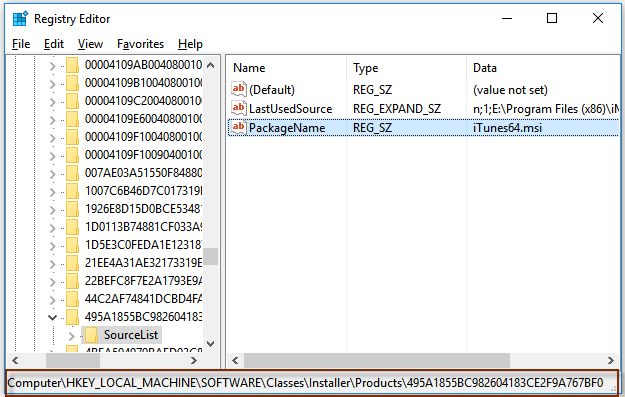 This will prevent Windows Installer from searching the .msi when reinstalling iTunes. Step 1: Double click the iTunes.reg file that was saved in the above mentioned steps. This will restore the data to the registry. Step 2: Now install missing components in order to unpack the install of the previous iTunes installation. This will allow you to extract the required .msi file. Step 3: Once the file is extracted, double-click on it and the component will be uninstalled. 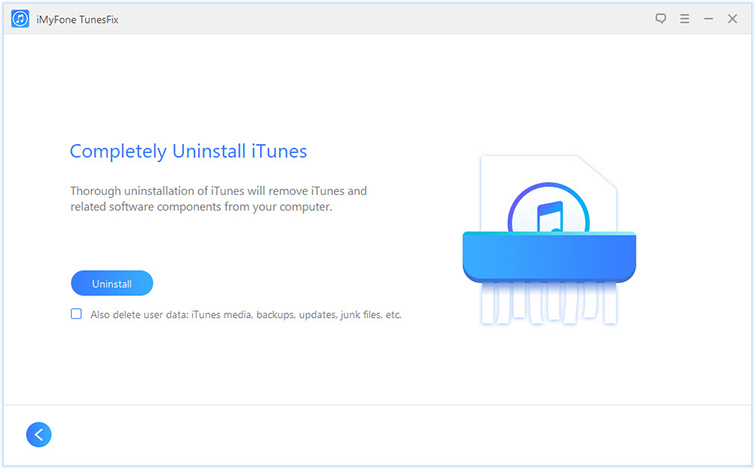 Step 4: Now you can proceed to the uninstallation/reinstallation of iTunes. The problem should be solved now. Step 1: Open Control Panel on your Windows PC. Step 2: Navigate to Programs > Programs and Features. Step 3: Find and choose iTunes and then click the Uninstall option to uninstall it. Step 5: Once all the components are uninstalled, restart your computer. In conclusion, there are a number of ways to uninstall iTunes if you can’t uninstall iTunes windows 10 the usual way. Automatic method to uninstall iTunes (TunesFix) is the best way because not only is it convenient, it also takes significantly less time. Manual way to uninstall iTunes is complicated and takes more time.